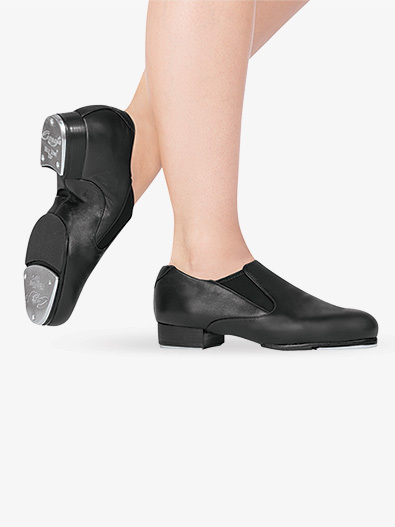 Capezio's Riff slip-on tap shoe is constructed with a full grain leather upper with medial/lateral elastic gore inserts. The lightly padded collar and Achilles is for pressure relief and comfort. Other features include a padded footbed with non-slip socklining, TeleTone toe and heel taps, and split-sole construction with extended leather forepart to provide additional support during toe stands. Suggested Fitting: Women order street. Men order 2 sizes larger than street.